Manchester United could be set to announce the signing of Arsenal star, Alexis Sanchez on a staggering £450k-a-week deal. The 29-year-old Chilean superstar is ever closer to joining the Red Devils after he was spotted leaving an airport in London yesterday jetting out for his medical at United’s training ground, Carrington. The player was expected to join Manchester City but we have usurped the Citizens to his signing, as they were scared his signing could cause dressing room unrest. The superstar was spotted taking a selfie in a United jersey after his medical complete with his name at the back alongside the number 7. All that needs to be done for the deal to be completed is the updating of his work permit by The Home Office. The BBC reports that the deal can only be made public once his work permit is updated, leaving him to be announced and unveiled as a player of this illustrious club. 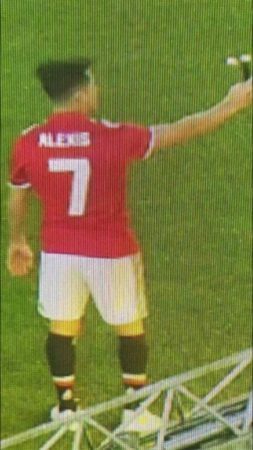 The picture of Alexis Sanchez taking a selfie in the United jersey has gone viral on social media. Many club fans are already welcoming him to the club while others are already attempting to buy replica jerseys at the club’s official store. Henrikh Mkhitaryan is also facing the same issue ahead of the move to Arsenal, as his work permit also needs to be changed. Sanchez is a truly phenomenal player that will add remarkable quality to out front line. He can play as a left winger, right winger and even as a striker and will offer more threat going forward. He joined Arsenal in the summer of 2014, scored 80 times in just 165 appearances, and winning two FA Cup trophies in that time. Previous : How will Manchester United line up with Alexis Sanchez?